A family who eats together, stays together. That was the childhood philosophy of the 22-year old Jeanerose F. Bitol. She is a licensed teacher who is happily educating lovely children in the Philippine Women’s College. But behind her charming smile and captivating face lies a chaotic story of a child who has lived with three different families bound through marriage. Jeane was brought to this world in year 1990 and was warmly welcomed by a family of five. She was the youngest child in the family. However, it was years later when the truth dawned on her. She was not actually living with a family of five, but a family of eleven. Her parents each had a family before them. Her mother got widowed from her first husband and was left with three children. On the other hand, her father was a widower and was left with two children. As the youngest, all the attention was on Jeane. Happiness overwhelmed her young life. She was given a proper education under the roof of a happy family, although their economic status was barely capable of doing so. She had never thought that her half-siblings on her father’s side had envied the attention that she was getting. It triggered her half-brothers to be jealous through and through. She was treated by them as a pain in the rear. Jeane seemed to be the one that was being considered and prioritized most of the time. It was her education that mattered most. Her siblings in both sides already had had their share and lost it. They wed at an early age and so were her three brothers and two sisters. She was the lifesaver. She was her parents’ investment. Her high school existence was as swift as the wind. It made her life. At home, she was treated as the all-so-infuriating little sister, unlike in school, where she was crowned as the darling. She had a fair share of boyfriends and it strengthened her brothers’ idea of her becoming a young mother. No one wanted to send her to college. Her other brothers and sisters had not been capable of doing so. She was told that she wouldn't even finish college and would just end up with a motorcycle driver. She had thought the same about herself it had her crumbling down at her very core. 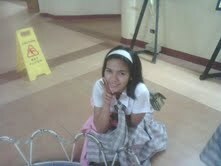 Fortunately, she found her way and tried her luck at Holy Cross of Davao College. She took the entrance examination and at the same time, she applied as a student assistant. She then started to see what life had in the works for her. She passed the examination and she then tried her very best to prove her half-brothers that she wouldn’t end up as the poor wife of a motorcycle driver. From the comforts of her home and family at Malabog, Paquibato District, Davao City, in the Philippines, she ventured to downtown Davao City and settled herself at her aunt’s place. From the all-so-naughty little lady that she had been, she had turned over a new leaf and had become a mature and determined person. She was all fired up to prove her brothers wrong and so with anyone who had her thinking that she wasn’t good enough. In her college days, she gained friends, joined the Dean’s Lists’ rank, and had her fair share of disappointments. She studied in a Christian Institution and sadly, her family background backfired along the way. Some eyes doubted her explanation while some were impressed. It gave her the firsthand experience of being stereotyped at school which she wasn’t prepared of. "Am I going to do this? Will I graduate? I want to runback to my mom", were the thoughts that kept running through her head. She was prepared to lose everything just to reach her goals, but life wasn’t that kind to her. It was racking her boat so hard that even her will to carry on was slowly fading away. It was one of her homecomings that made her fully aware of what she was supposed to do. One day, her half-brothers approached her and bluntly said that she was just wasting all their parents’ money. Jeane’s mother, who was very busy in preparing her arrival celebration, was in total shock when the commotion started. Jeane confronted her half-brothers, though she was aware that she wasn’t supposed to do so because she was the youngest. “I was very upset and I couldn’t help but slap them with words I’ve kept inside of me for more than 19 years. I even said that they wasted their chance, and I wouldn’t waste mine”, Jeane said. It was all or nothing. She went back to the city carrying her rekindled fire of proving her brothers wrong. She made her way to the top. Jeane performed as the best student assistant that every boss could ever ask for. She also excelled as a student, and managed to cope with all the disappointments that knocked at on doorstep. When she reached her final year in college, she did her best to impress her teachers. Her strong desire to graduate and become a professional motivated her to keep going. She knew that it was her brothers’ loss for showing that they didn’t deserve to be respected by her. She never halted, she never paused to feel the pressure, and she never dared to do so because it would just pull her down. It was the very last thing she would want to do. After four and a half years of wrestling with destiny, she finally graduated and made her mama proud by having a Bachelor’s Degree in Education. She eventually showed everyone who didn’t have faith in her that she successfully made it. Jeane also proved that her achievements wouldn’t stop there. Eight months after her graduation, she got her license and got hired as an elementary teacher. Now, she is currently paving her way towards having a Master’s Degree in Education. Her philosophy back in her childhood wasn’t forgotten though. The criticisms and bitter judgments from her siblings had somehow motivated her to succeed personally and professionally. Jeane felt that blood was still thicker than water. She still longs to have a peaceful and happy family with her half-brothers and hoping that someday, she will be able to say that A family that eats together, stays together.